Back to studying reflections. 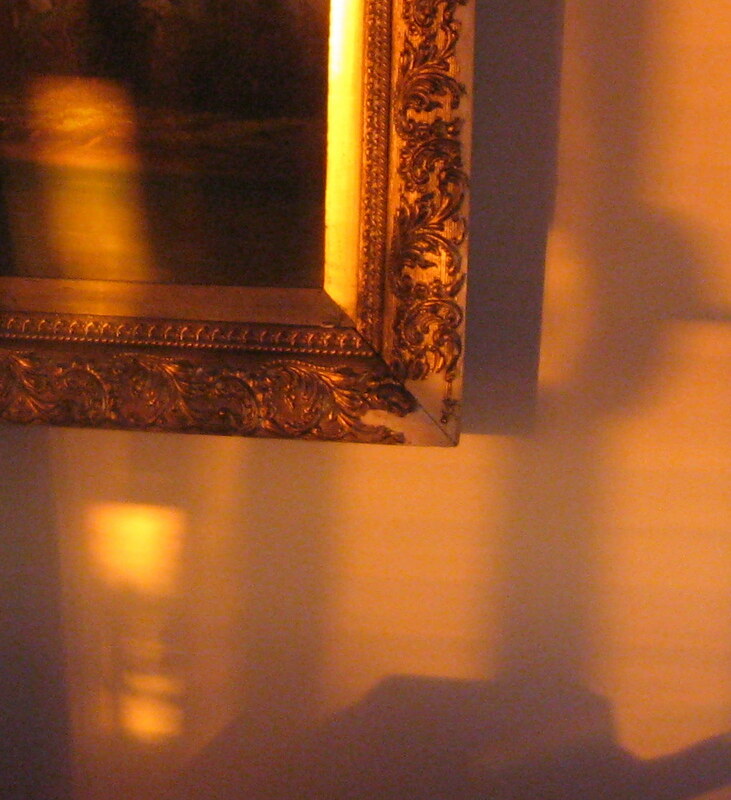 I’ve been photographing them in my living room—sun bouncing off of melting snow puddles and shining on my walls. I had been missing them and was wondering if I would ever see reflections on my walls again, or if our new house got too much real sun. Then I saw that the last reflection photos I took were at the end of March last year. I had never really noticed that it was a springtime phenomenon, but I guess it is. I also have photos of reflections when they land on my paintings which I’m finding fascinating to see how it alters the painting, almost abstracting it. So last week I needed to get my mind off some things and I sat down and finally started on a painting based on one of my photos. I’ve had a little colour printout of this image in my studio for 3 years and never done anything with it. It was a very interesting experience to be painting from a photo of my own painting. I like the new version better. It felt like I finally knew how to paint again, like the past 7 months of work for my blog (arguably the past 7 years of work) was all practice stuff. And perhaps it was. And although I really love this one as a painting in itself, I’m not sure how successful it is as a study of relections…but there will be more reflection paintings. The reflections weren’t enough by themselves but I just didn’t know quite what to do with them. I think the reflections on top of my paintings taps into something more. Just thinking about all the possibilities makes my head spin. First there’s the original paintings, then photos of the paintings with reflections on them, then paintings from the photos… it’s a whirlwind of endless subject matter! Here’s the photo that I used for this painting. 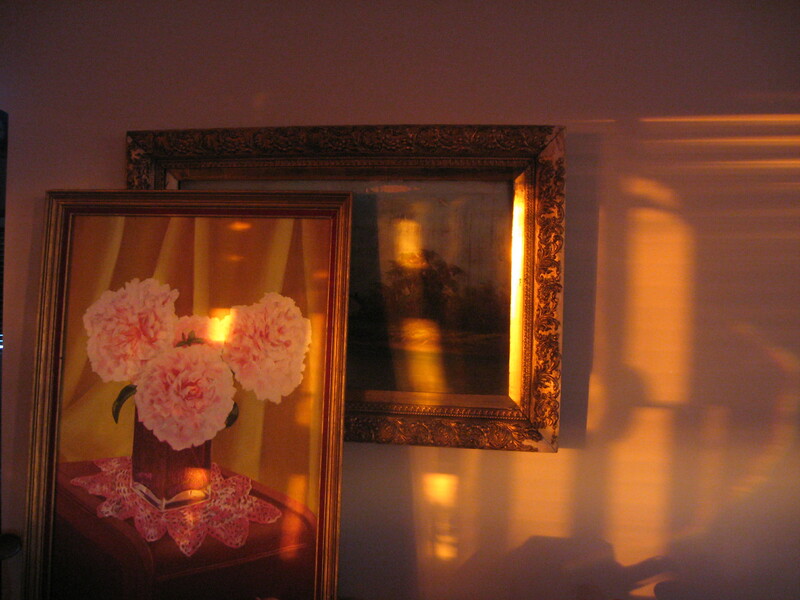 It was direct morning sunlight in the house that we rented. We had just moved in and I was still unpacking and hanging paintings up, and I had them sitting on the table beside the kitchen (t his photo was taken just 3 days before I went into labour with my daughter). Interesting to note this is also the image that I cropped for my Gravatar (the image beside my comments on the blog). I think I knew there was something to my reflection photos before I actually realised it. this is really cool Dayna – love all the pinks and gold tones. i also really like the way you painted the shadows and reflections. it seems to me you’re getting better and better – and the paintings even seem more self-assured. Thank you Shawna! I am feeling more self-assured lately. The blog has helped me make a habit out of making art–I’m constantly thinking about my current or next project and it seems to come easier now.